Snow was the stuff of dreams when I was a kid. It’s not that it didn’t snow in Cyprus. It did, but only high up in the mountains and it was a rare occasion that we would drive up there to experience it. Our car was not equipped for snowy or icy roads and my parents were reluctant to risk going up there unless the roads were plowed and the forecast was clear. Where we lived, down in the mainland, it pretty much never snowed. Which meant that my sister and I spent winters wishing for those perfect conditions that would get us up there, so that we could build a snowman and have a snowball fight. Because we knew that snow would never arrive out our house. And then one year, I must have been eight or nine years old, it happened. The temperature dropped and clouds gathered. The forecast was definitive. There would be snow all the way down at sea level. Our parents woke us up in the morning and told us to come to their bedroom. All four of us got under the covers and watched the snowflakes gently fall outside the bedroom window. My mom talked about how serene and calming it was but my sister and I wanted only one thing: to go outside and play in the snow. “It’s not snowing enough to stick,” my dad told us, but we were undeterred. Thirty minutes later my sister and I were throwing mud balls at each other, much to my mom’s displeasure. We are getting a snow blizzard this weekend here in the Northeast. In New York snow always starts out beautiful, drowning out the noise of the city and erasing the harsh lines of the buildings and sidewalks. It eventually turns into black sludge and everyone hates it but for a few hours, it’s quite magical. 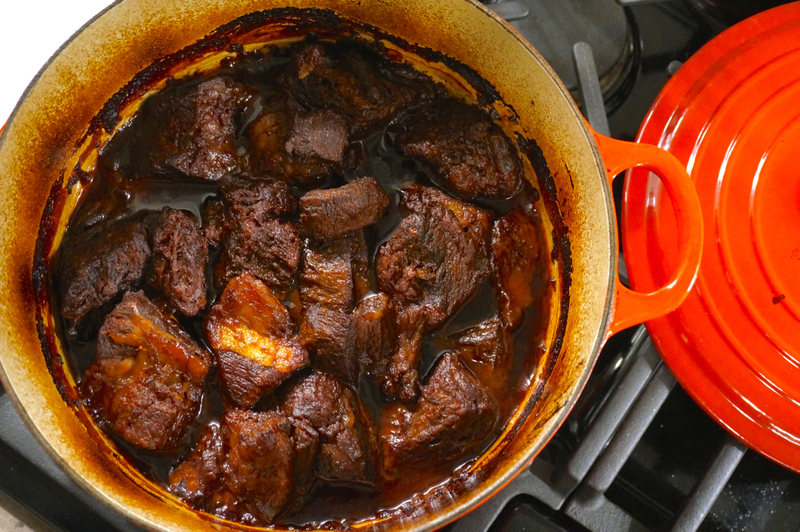 If you are going to be in the path of this storm or any other snow storm, make these short ribs. They will warm your soul and nourish your body to get it ready for those snowball fights or shoveling chores. Note: The recipe uses a roasting pan but I’ve always used a dutch oven. I brown the ribs in the dutch oven, remove them and cook the chile puree in it, add the remaining ingredients and the ribs and braise them. This way I only use one pot. 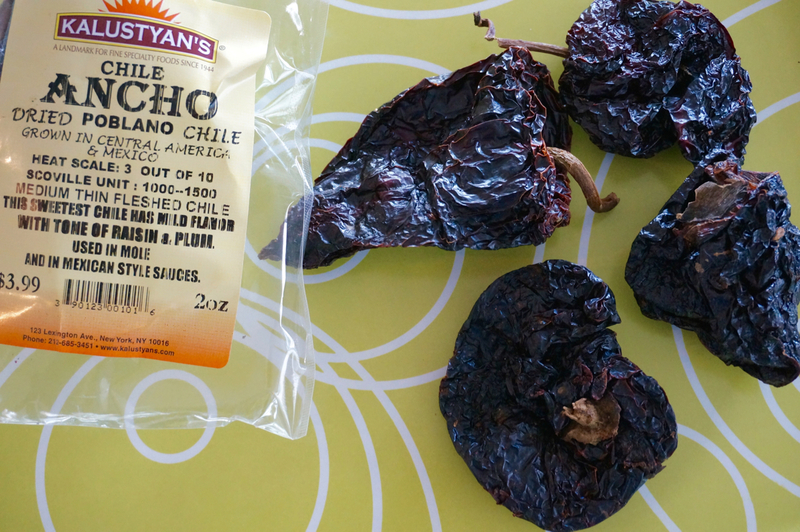 Soak ancho chiles in boiling-hot water until softened, about 20 minutes, then drain them reserving the soaking liquid. Transfer ancho chiles to a blender and purée with onion, garlic, chipotles with sauce, maple syrup, lime juice, and 1 teaspoon salt. Pat ribs dry and sprinkle with pepper and 2 teaspoons salt. Heat oil in a 12-inch heavy skillet over moderately high heat until hot but not smoking, then brown ribs in 3 batches, turning occasionally, about 5 minutes per batch. Transfer as browned to a roasting pan just large enough to hold ribs in 1 layer. Cover roasting pan tightly with foil and braise ribs until very tender, 3 to 3 1/2 hours. Skim fat from pan juices. 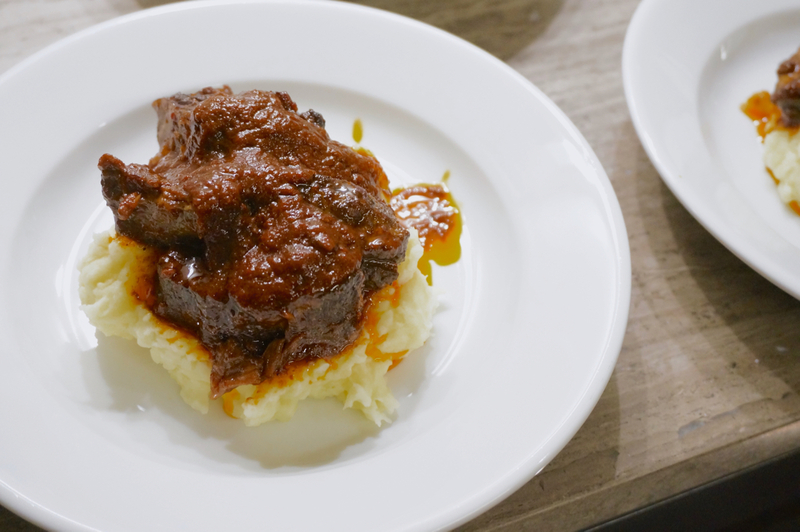 Serve ribs with mashed potatoes or soft polenta and with pan juices. This entry was posted in Recipes and tagged ancho chile, beef, braised, poblano chile, short ribs. Bookmark the permalink.